False Alarm Management (FAM), is built around configurable time periods that occur either side of a latched fire condition. The time period before a latched fire condition is specified as Alarm Verification and the period after is Investigation Delay. They both offer significant but different FAM options and are managed in the same way with our DynamixTools software which has been designed with ease-of-use and speed of configuration in mind. AlarmCalm’s configuration is simple. In our DynamixTools Config software there’s a new programming tab where all FAM configuration takes place. Settings are managed via simple yes/no matrices and even involved configurations can be achieved in very few clicks. Two kinds of verification methods are allowed on the Advanced fire network. Allows any qualifying detector to go in to alarm for up to 60 seconds without it causing a full fire alarm. The panel will not display the alarm during the verification period. Delivers greater flexibility with every aspect of verification methods and allows full programming of outputs and visual warnings during the verification period. The alarm location is displayed at the panel and any associated remote terminals throughout the verification period. Verification can occur simultaneously in multiple areas. Users can set the maximum number of Building Areas in verification at any one time before a full fire condition is indicated. Using the programmable time clocks available within Advanced's DynamixTools Config software, different false alarm strategies can be programmed according to time of day or day of week. For example, different verification settings can be applied during the day or night and investigation delays can be programmed to be in use at different times and days. Each time clock works on a seven-day week, allowing different verification or Investigation delay strategies to be activated during weekdays, weekends, during the day or at night. AlarmCalm allows devices that support multiple sensitivity modes to verify an alarm using different settings based on time and day. For example, combined optical/heat detectors can change to heat-only mode to verify the alarm. • Verified by mode change. For example an optical/heat detector can confirm fire if it confirms a signal in both smoke and heat modes. Verification can be set quickly and simply according to device type in each Building Area. Heat, smoke, multi-sensors, call points or any input modules can be used as verification inputs. They can be set individually or by device type. Sounders, beacons and relays in each Building Area can be operated during the verification period. They can be quickly set by all devices of each type or individually by point. With Type B (Displayed) alarm verification, AlarmCalm delivers a number of adjustable timing parameters. The verification time starts from the instant the smoke in a detector increases above alarm threshold or any other applicable input device is activated. The panel will turn on any programmed verification outputs for the Building Area during the verification time. 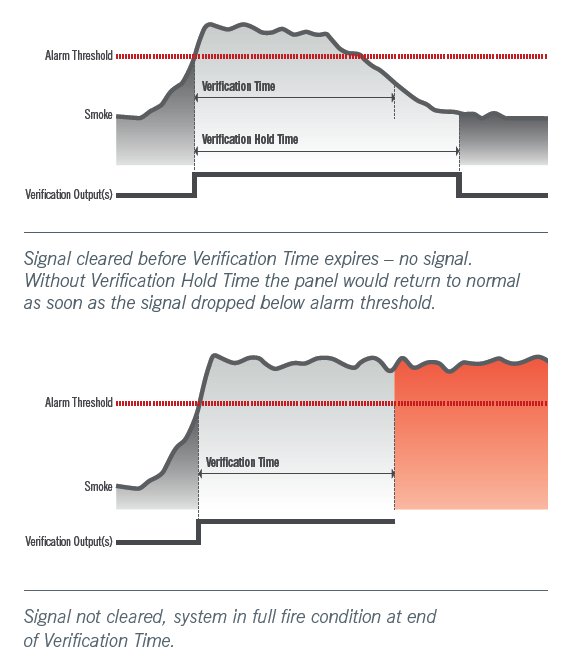 Verification hold time helps ensure that transient signals are displayed on the panel long enough to be acknowledged and investigated, but still trigger full alarm conditions when necessary. If the alarm signal clears before the verification time period has elapsed the system returns to normal operation after the verification hold time has elapsed. This can be more or less than the verification time. If the smoke or signal from a device remains above the alarm threshold when the verification time elapses, the panel will go immediately into full alarm condition. Sounders can be programmed to turn on using different ring styles to distinguish each stage of the verification or investigation delay periods. Output delays are managed by AlarmCalm in exactly the same way and flexibility as verification delays. Day/night settings can be applied as well as the option to set the maximum number of Building Areas to be investigated. Delayed alarm inputs can be set quickly and by all devices of each type, or individually by point. Verification alarm in and Building Area is acknowledged without any effect on verification outputs. Verification alarm in any Building Area is acknowledged and outputs are turned off. Dual function acknowledges both Investigation Delay and Verification Alarms. Global alarm acknowledgement from other panels can be included or excluded by sector. All verifications and delays are recorded in panel event logs.